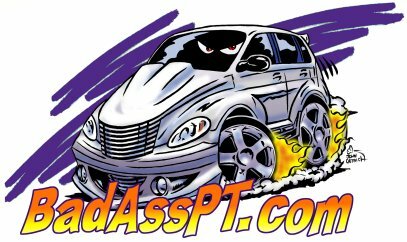 BadAssPT.com - It's not just a car, its a statement! As you browse the website you will find photos, news, links, FAQ and even a parts list. If you ever find yourself lost in the website you can always use the site map. 8. Exterior Shot Good view of the entire body style and design. 9. Front Glare Can you say bling, bling? Look at these 20 inch rims. 10. 3rd Brake light The custom 3rd brake light.